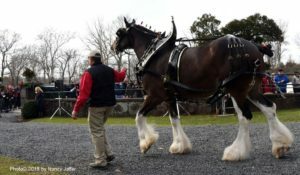 The Budweiser Clydesdales’ appearance at the U.S. Equestrian Team Foundation Dec. 1 drew a crowd of about 600, eager to get close to the horses they know from so many creative commercials. Presented by Sergeantsville Feed & Grain and Purina Animal Nutrition, it was an opportunity for the public to see these gorgeous giants up close and in action around the arena. The event in Gladstone, which included a demonstration of hitching the horses to their Studebaker wagon, benefited A Home for Every Horse and the USET Foundation, which raises funds for competition, training, coaching, travel and educational needs of the country’s elite and developing horses and athletes, in partnership with the U.S. Equestrian Federation. 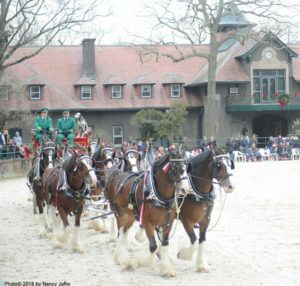 Check out the videos of the Clydesdales below, and enjoy a ringside seat for a great exhibition.